Kelly C. Engebretson, an attorney with our litigation team, plays midfield for the USA Women’s National Bandy Team. Bandy is played on an ice surface the size of a soccer field, and the only Bandy ice sheet in North America is located in Roseville, Minnesota, at the Guidant John Rose Oval skating rink. Bandy is best described as field hockey on skates. Each team is made up of 11 skaters, including a goalkeeper. The aim of Bandy is to score goals by hitting an orange or pink ball the approximate size of a tennis ball into the opposing team’s net with a curved stick four feet in length. The rules of bandy are very similar to the rules of soccer, and the sport is most popular in Russia and the Scandinavian countries. The sport is so popular in Russia that, when Russia hosted the Men’s World Bandy Championships this year, President Vladimir Putin attended the tournament. 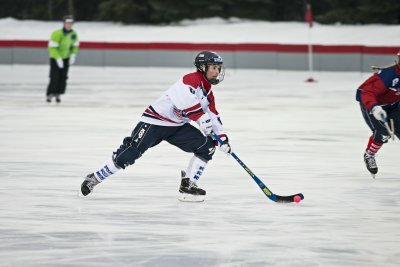 From February 18-21, 2016, Team USA hosted China, Russia, Sweden, Finland, Norway, and Canada for the Women’s Bandy World Championship, which was held at the Oval. Team USA placed 5th in this year’s Women’s World Championship. The women’s tournament is currently played every two years. Congratulations to Kelly and the rest of Team USA!